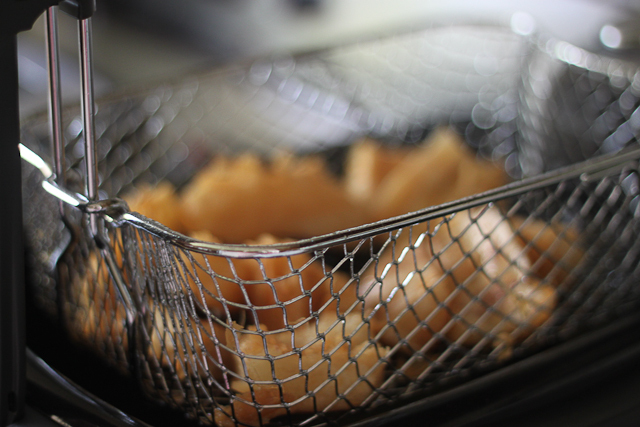 Kitchen Corners: In case you were wondering, deep fryers are the bomb. In case you were wondering, deep fryers are the bomb. The kids were eating deep fried mandioca (yucca, cassava, manioc, tapioca root ... any other names I don't know of?) for their afternoon snack. 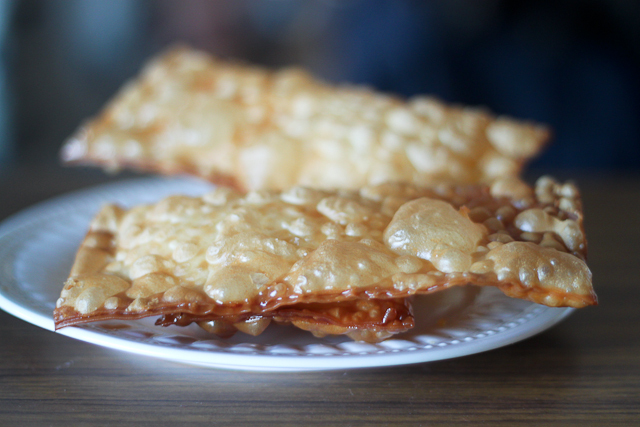 Have you ever had fried mandioca? If the answer is no I will gladly come to your house with some cassava root in hand and my new kitchen toy, the Breville Deep Fryer from Williams-Sonoma and I will personally make you some. It's no secret that I've ALWAYS wanted a deep fryer. I asked Christian to get me one for our anniversary last year (romantic, no?) and when he didn't I wrote about it in the news paper which made it's way to the Family Student Housing newsletter on campus where we live. Christian was so busted. Back then I didn't even know about the Breville deep fryer. Now I own one. Williams-Sonoma sent me one for review. When the deep fryer arrived in the mail I turned to Christian and said "my dream came true" and he's all like, "no, my dream came true because I didn't even have to buy it for you" and then Gabriel is like "no, my dream came true because I get to eat crispy mandioca and I'm not even in Brazil." Needless to say, we were all stoked. O.k the things is, if you are already super stoked on something before you even use it the potential for disappointment is huge. I had never used a deep fryer before. I have read about them and I've watched videos about them (I know! don't even say it) but I had never actually tried one out. I basically wanted a deep fryer for one main reason -- safety. Frying is dangerous. I've splattered myself with oil plenty of times, one little drop hurts bad a whole pan pouring down on your feet or, even worse, on your child would be tragically horrible. I've thought about this a lot. In fact I think about kitchen safety all the time. 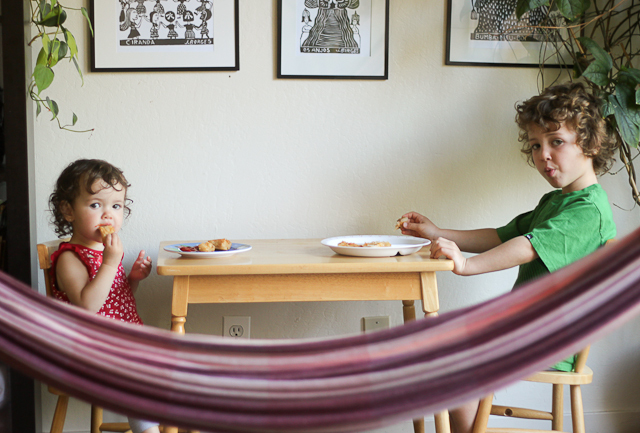 This is why I put up a baby gate in the kitchen but still sometimes the gate is left open, sometimes the kids are just in there, it's never a totally controlled environment. I wanted a deep fryer because I wanted the oil to be contained on top of the counter, away from where the kids could reach it, and I wanted something that didn't have a handle that stuck out like a frying pan because I'm always bumping into the handles and the kids are always trying to reach the handles. So I discovered this thing of beauty and I will never go back to frying on the stove top. 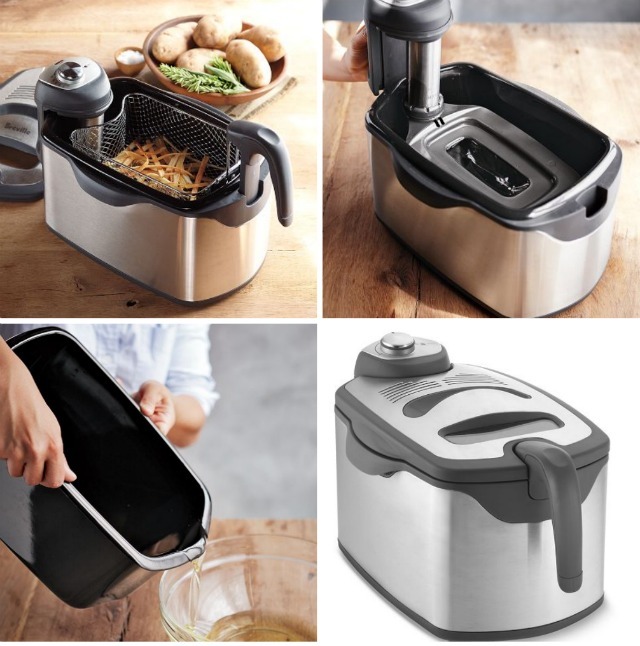 The handle on the Breville deep fryer is exactly what I was looking for. Not only that but the plug meets all of my safety expectations. You can't see it in the picture but you can see it in the video here, the magnetic release power cord makes it so that there is no risk of the kids tripping and pulling down the entire fryer down on them. The other things I discovered were an added bonus. I love that I can control the temperature of the oil and that once I set the temperature I don't have to worry about the oil burning. This is huge for me because I rarely get to make something from start to finish without interruptions. With the deep fryer, if I need to go break up a fight, answer the phone, get the kids some water, I can. I can walk away for as long as I need to. When I come back the oil will be at the exact same temperature. I also love how little oil I need to use and the fact that I re-use the same oil over and over again. I just leave the oil in the deep fryer and when I decide I'm going to fry something I turn the baby on and go at it. Now, this is a Damaris thing I'm not sure you're supposed to re-use the oil over and over again but I do and I've used it more than 5 times now without any additional odors or problems. Speaking of odors you know how when you deep fry the whole house smells for 3 days straight? That doesn't happen with the deep fryer. It still smells like you fried something but not for 3 days straight and not your entire house. Nope, not even. Other bonus, the food comes out perfectly crispy. I've been making homemade pasteis. I would love to share some with you. Ooo.. Even I want one of those!! My favorite fried food has to be donuts!! 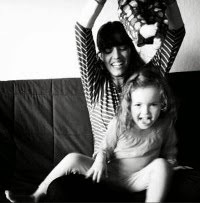 :) Btw your kids are beautiful!